Most of us associate Jägermeister with frat parties, annoying drunk people, and frat parties. But the drink itself — a generally misunderstood, hazardously abused liqueur — has an interesting history, nuanced flavors, and digestive kindness. Add an 80-year-old secret recipe, and you have a drink that deserves closer inspection. Here are 10 things you should know about Jägermeister. Jäger is fancier than you think. It’s been shamelessly frat-boyed and is most certainly imbibed in bar-dive darkness — you know, those nights when the air is deliciously musty, haunted with the bittersweet tang of future regret — but Jägermeister, made with 56 herbs and spices, is in fact a “digestif.” Put briefly, digestifs and aperitifs are both lower-ABV liqueurs infused with herbs, spices, bark, love, etc. Digestifs, however, are specifically intended to aid digestion. On the digestif spectrum, Jäger is sweet. But it was born out of sour. Wilhelm Mast ran a vinegar company in Wolfenbüttel, Germany, slightly south and a bit west of Berlin. That’s where his son, Curt Mast, let his spirit for spirits blossom into the creation of Jägermeister, a liqueur flavored with a very secret recipe that melds spices, herbs, and a year of barrel-aging into something we should probably sip slowly but instead, for some reason, down prodigiously. Topping out at 35 percent ABV, it’s basically a liqueur with the abs and/or core-strength of booze. We do bad by Jager, but it does us good. Jägermeister, like many digestifs, is made with many ingredients. Whether you drink it thoughtfully, or drink to forget so, so very much, you’ll get a blend of citrus, licorice, even saffron and spice on a rich, sweet, ruddy brown background. General consensus is to not chill it too hard, as that dulls the flavor. The Jägermeister label hasn’t really changed in the 80-plus years the liqueur has been produced, and it’s still terrifying. 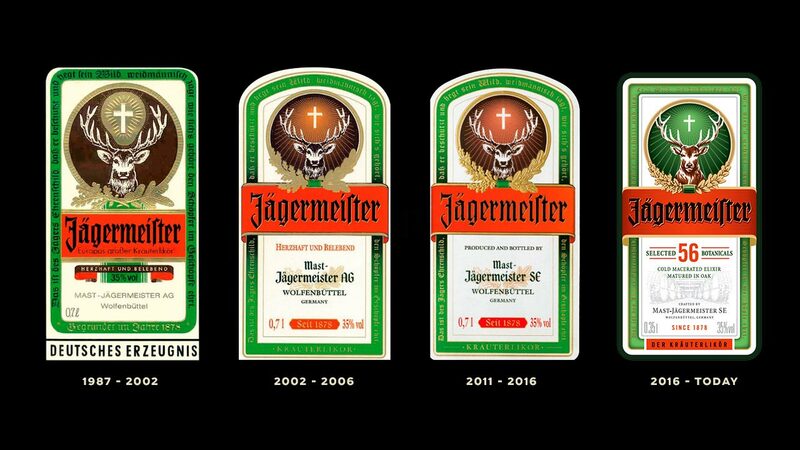 Whereas other alcohol labels try to seduce, intrigue, confuse, Jäger’s label is almost entirely literal: a stag, with a cross over it, indicating the founder’s son’s love of hunting and guilt. Also, it’s very angry at you. We call it Jäger. Maybe that’s for the best. Here’s what’s with Jäger and Nazis. The town of Wolfenbüttel was a popular destination for Nazi soldiers during the war, and Curt Mast, son of Jägermeister founder Wilhelm, was an avid hunter and apparently savvy, albeit morally compromised, businessman. As the story goes, he named the drink “Master Hunter” to appeal to that particular market, although later distanced himself from any ties to Nazis. Which, all parties agree, was a good move. Jägermeister is made with deer’s blood! Or it’s vegan. Either way. Jägermeister comes with a stag, a.k.a. giant manly deer, on the label. For a long time, people took this to mean the drink — and whatever intoxicated sense of virility we all have after consuming it — owed its special power to deer blood. The recipe, closely guarded to this day, does not actually, or at all, contain animal blood. And, according to at least one online explanation, it’s probably vegan. You can read the company’s explanation of its lack of stag’s blood here. There is a poem on the label. Jäger takes shots to the next level. For some reason, Jäger shots inspire both bad decisions and technical skill, depending on which side of the bar you’re on. This is actually a fairly impressive trick. One unidentified screaming bar patron sums it up with, “Dude, you’re gonna be so famous.” She’s shouting, and that’s annoying, but she’s probably not wrong. Jägermeister has quite possibly the best, or the worst, marketing slogan. In case you were wondering what you’re flooding down your gullet at 2:00 a.m. next to a dude named Randy who thinks he might major in “extreme poetry,” it’s Liquid German Perfektion. Also the name of my forthcoming autobiography, and probably several unsuccessful but really well-meaning garage bands.